A compelling exploration of the lost yet crucial role of ritual in our increasingly secular lives. It is written for the part of us that yearns for living ritual. With a foreword by Mark Rylance. William Ayot was born in rural Hertfordshire.Having worked in London’s casino industry, he underwent a personal transformation, rejoining the world as a poet, teacher and ritualist. He has worked in rehab, prisons, and men’s groups, led rites of passage and taught in boardrooms and business schools around the world.He lives in a restored Monmouthshire gentry-house with his wife, psychotherapist Juliet Grayson. "William Ayot is an explorer. This marvellous book is a testament to his expeditions into the unknown." From the foreword by Mark Rylance. What is 11 - 6 ? Williams book touches me in a truly deep and meaningful level, Thank you. This book is a frank account of the author's personal journey to find enlightenment through ritual, and would be helpful to others. Beautifully written, with wonderful evocative language, and extensively researched. Really good insights from such a clever and wise man. I have always found William's work to be inspiring but this book has surpassed my expectations. Thank you William. William Ayot draws us deep into a potent world of meaning through courageously accepting and bringing significance to the gift of being human. William seems to operate in a world where words and explanations don’t operate as easily or usefully as in everyday life. How he managed to write the book at all, let alone write it so touchingly, eloquently and evocatively is truly impressive. Shows how much we need poets. I find that in my culture, ritual is depicted as niche and wacky (it does to many of my friends), but for my ancestors, it used to be the central pillar of life. And I find today that when I experience or witness it, it is a very powerful and healing force. William’s book is important because explains the relevance of ritual in our culture today, the damage caused by its loss, and the good that can come from its reintroduction, formally or informally. And he speaks only from his own experience, no theorising. This authenticity makes it very readable and accessible, and he wields words like magic. Thought- and action-provoking… although I’ll need to allow plenty of time for it to sink in. Thank you William. I thoroughly enjoyed reading this from page 1 to the last page. This deserves to win. William Ayot's writing gives words to the thoughts I haven't yet realised I had and reminds me that I have a soul. As a lover of trees and woodland, I had to vote for this book. William has recounted his life and work with great honesty. I felt I was right there when he was recounting the rituals, it was a touching experience. Thank you. William's poetry touches the humanity in us all, in a way that is meaningful, memorable and very poignant. When I read his poetry I feel connected with the human condition and it never fails to move me. Intruiging, deeply personal, and soul-expanding. As a poet, William's turn of phrase is often sublime and frequently very moving. Whether you are drawn to participate, or just wish to find a deeper understanding of ritual, William's book deserves a place on your reading list. A beautiful book which combines a fascinating insight into ritual, with a very moving account of William's own journey. William Ayot's writing and poetry offer insight and pathways for healing of past hurts, and this book is no exception. 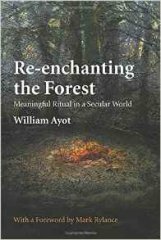 William generously and movingly explores the place of ritual in healing and personal freedom. I have given copies to friends who have loved it. I have avoided all ritual as a result of unfortunate experience with religion. This moving personal record made me realise that I'm using ritual all the time both personally and in my work – this has helped me take responsibility for its use and potentially benefit both myself and my clients. This is an inspiring book of a man's courage to face his past, his demons and journey through discovery to find to his own fulfilment. His power and ability to invoke ritual and with his poetry makes him a man to be both admired and envied. He is a role model of male humility, power but can also express beautifully male gentleness and compassion.. The personal journey in the early chapters is wonderfully rich and compelling reading and the whole book clearly demonstrates the importance of ritual in our lives. A valuable and unique contribution to the much missed world of ritual in the 21st century. The author leads us on an adventure into healing and transformation through his explorations of ritual. It is compelling and poetic leaving a taste of renewal and hope. This book really moved me...as Parker Palmer says in his praise for Re-enchanting the forest" - 'this book changed my life'. Well it has changed mine too. The rituals William describes are moving and inspiring. but what is also moving is the honesty with which he writes about his own journey. William brings poetry to the everyday life, and reminds me of what is important. Fantastic!